This basic pizza dough recipe is adapted from the Betty Crocker cookbook. One batch, separated into two parts, makes two round pizzas. 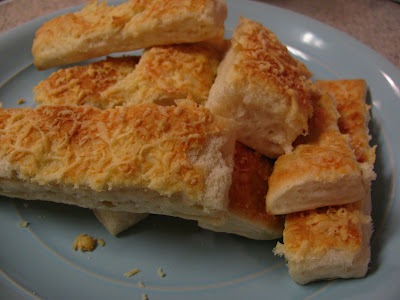 Or you can use all of the dough on a large rectangle pan to make delicious, fluffy breadsticks. The adaptability is endless—this recipe can be used for white pizza dough or wheat pizza dough, and the breadsticks are limited only by your imagination! Some of my favorite breadsticks: 1. All-white flour brushed with olive oil and sprinkled with salt and fresh parmesan, baked till crispy and golden outside and white and fluffy inside (shown above.) 2. Half-wheat, half-white, brushed with butter and sprinkled with grated cheddar cheese (shown in the picture with the potato soup). You can also add your favorite combination of spices....something we do often! For pizza: divide dough into 2 separate balls. Working dough gently with fingers, spread on 2 greased round pizza pans. Brush edges with olive oil. Top with desired toppings and bake at 425 for about 12 minutes. For breadsticks: Working dough gently with fingers, spread dough on greased rectangular pan. Top as desired. Before baking, cut breadsticks in dough with pizza cutter. Bake at 425 for about 15 minutes. Also, I think you should add your zucchini bread recipe (and any other recipes you may have shared on your other blog) here so they can all be conveniently found in one place. That's my 2 bits. =) Love trying family favorite recipes! Thanks for sharing. We did this and one time and tried butter with cinnamon/sugar, yummy! Have you tried this with wheat flour instead of white? Yep! In the recipe notes I talk about that. I actually usually do it with all wheat flour, but it also works great in any other proportion (half and half etc). For focaccia bread, it does work best if there's some white flour for a lighter rise, but for pizza I usually do all wheat.